Having been to the Georgia Aquarium in 2011, imagine my excitement when I found out that our local mall would be putting in an Aquarium!! Last time we were at the mall, we saw the sign for it and were super excited!! They just had their grand opening last month and I couldn't wait to attend. My kids didn't go with us to Georgia (in fact we only had 1 child then and she stayed home with grandma). So I was super excited for my kids to experience an aquarium since they've never been to one. This was the perfect opportunity for them to explore. First of all, if you plan on attending, PLEASE purchase your tickets online in advance. When we arrived the line to purchase was probably about 30 families long. Quite a time consuming feat. We were able to walk right up to the pre purchased line and were the only ones waiting! So we got right in just 3 minutes after walking in the mall entrance. The aquarium was very interactive for kids. They had 8 stamping stations with facts for the kids and they got a booklet to collect all the stamps in. That was fun for them. They also had some domes for the kids to get up in and explore the fish. We saw some fighting lobsters! and of course this Stingray! So funny! He was using the 180 degree tunnel as a slide. He did it 3 times in a row! It didn't take us too long to go through the whole aquarium, about an hour or so. There was a touchpool, but half of it was blocked off and the animals were 'resting', so the kids each got to touch a starfish and we moved on. The hermit crabs and shrimp were in the 'resting' section so the kids didn't get a chance to touch those. They have each section divided up. Jellyfish in one area, seahorses in another, etc. So it was nice to enter a new room and have it be a whole new creature. They even had a turtle room which was neat! Overall, it was a good experience and the kids really enjoyed it. I wish it was a bit bigger with more to do for the cost though. But overall we had a lot of fun. Overall: **** I really wish there was more to do, but it's inside a mall, so they couldn't exactly build it huge! 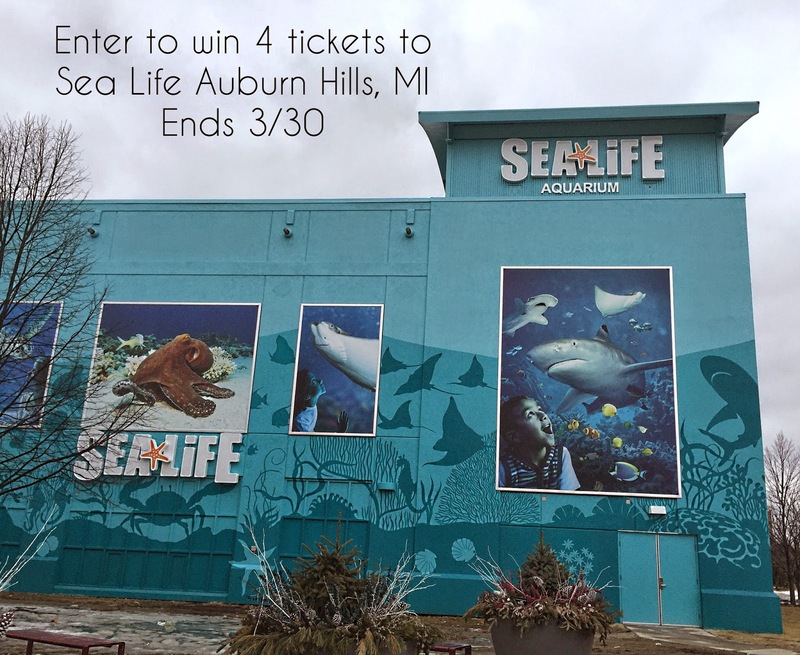 One winner gets the chance to win 4 tickets to Sea Life Auburn Hills! Dolphins are my favorite water creatures, next to sting rays, matinee, oracas and starfish...I pretty much am fascinated with them all. I absolutely love seahorses. They are so incredibly fascinating to me. We went to this aquarium a couple weeks after it opened. The kids really enjoyed it. Like you, we wished it was a little bigger. Still...we'd love to go back! Our favorite animals were the seahorses. Puffer Fish are my favorite aquarium animal! Thank you for a great article! I haven't been yet, but it looks like a great place to visit! We love the "Nemo" clown fish. Turtles are Awesome! We've been really wanting to go there. Thanks! I love watching the jellyfish & sea horses. I missed who won, but whoever did is super lucky!!! I was really hoping for this one!